Chinese New Year is something we observe by way of a home-cooked Chinese meal, now guided by Kathryn’s “clean Chinese” adaptations of some of her family’s favorite recipes, like her mother’s roast pork (Char Siu), her father’s Sichuanese “strange taste chicken” (Guai Wei Ji) or other random favorites, like steamed fish with ginger and scallions. Ms. Fabricant’s recipe framework is indeed excellent, but I believe my tweaks made her dish even more flavorful — and healthy. In a nod to ease (and what was in our freezer), I substituted two pounds of local grass-fed ground beef from Sawkill Farm (Dutchess County) for Ms. Fabricant’s two pounds of cubed brisket. Instead of soy sauce, I used coconut aminos (made from coconut tree sap that Kathryn regularly uses in lieu of soy sauce). A home-made hoisin sauce* replaced store-bought hoisin (which is loaded with sodium, sugar and other additives). I omitted the bell pepper (a personal choice, as I’m not crazy about them). To intensify the flavor of the Sichuan peppercorns, I toasted them before grinding. And rather than an amber ale, I chose Ommegang’s Hennepin Farmhouse Saison Ale. The result: an aromatic sensation, with intensely layered flavors of Five Spice, ginger and hoisin, underpinned by the chili heat and the toothsome, local grass-fed beef. Wow. 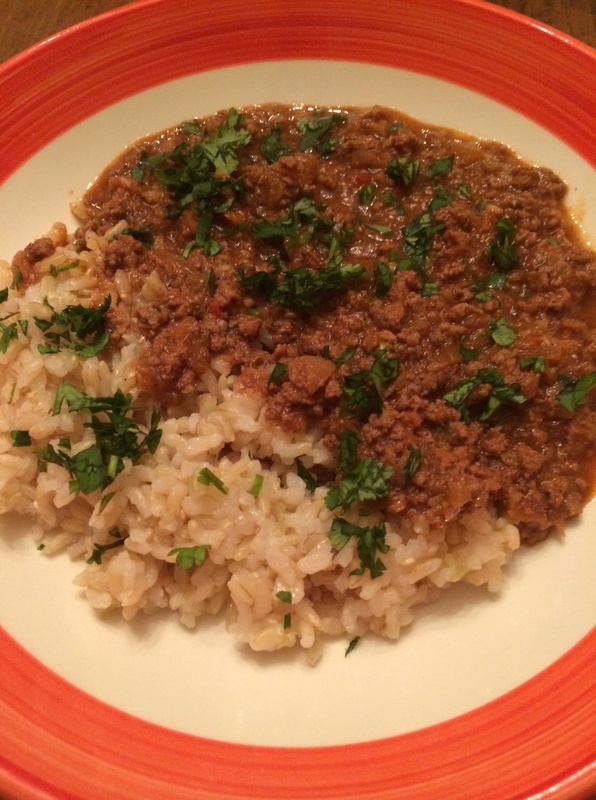 Brown the ground beef in the coconut oil on medium high heat in a Dutch oven or enameled pot, and remove with a slotted spoon into a large bowl. 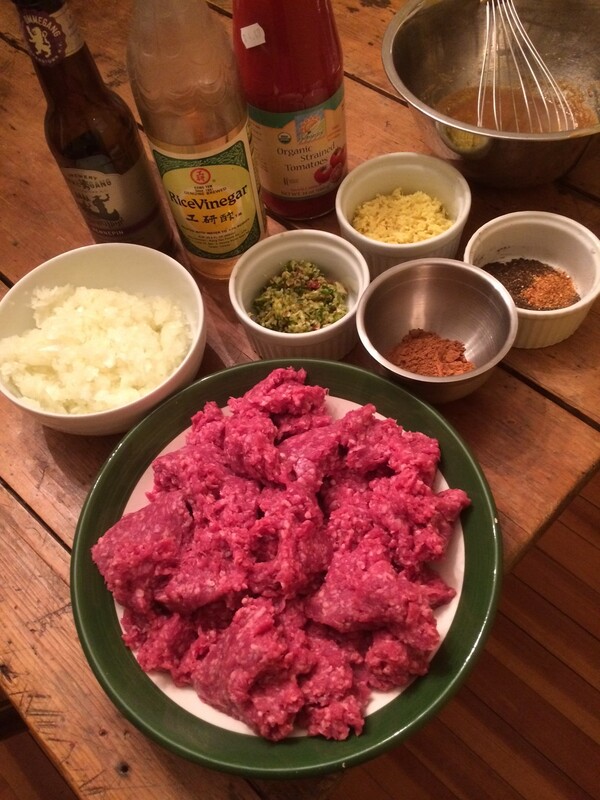 Mix the browned beef with the coconut aminos and hoisin sauce, and set aside. In the rendered beef fat (on medium heat), sauté the onions, garlic, chilies and ginger until tender. Stir in the Five Spice powder, Sichuan peppercorn, bird pepper and a half teaspoon of sea salt (optional), and cook for a minute or so. Add the ale, bringing mixture to a simmer. Stir in the tomato, and then add back the beef mixture. Cover and simmer for around 45 minutes. Then stir in the vinegar, adjust seasoning and garnish the dish with chopped cilantro. 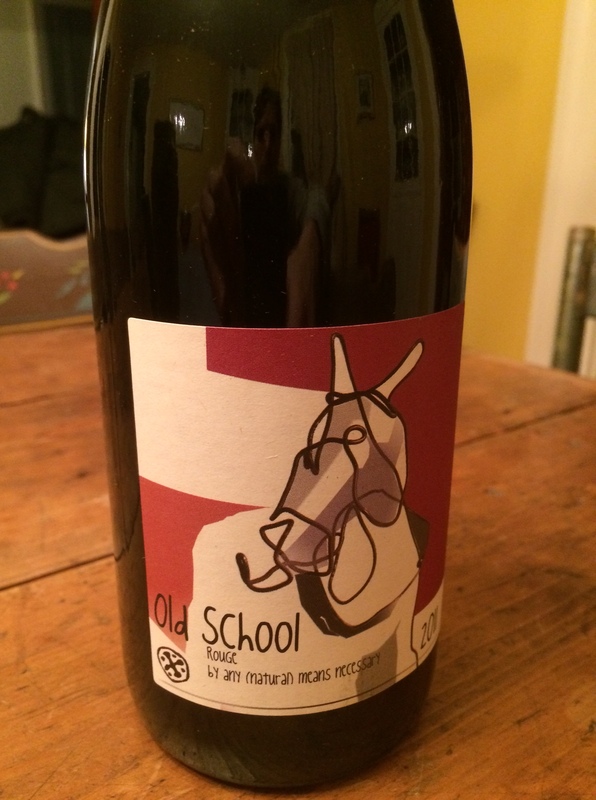 For the wine pairing, I didn’t have a Cali Syrah on hand, but I did at least keep to the Syrah theme, by way of France’s Languedoc region (specifically Minervois) and the certified organic “Old School Rouge” (2011) from Chateau Maris. Consisting of 90% Syrah and 10% Grenache, it’s full of juicy briar fruit, soft tannin and a touch of white pepper, a straightforward wine that stands up to the chili without fighting it. It’s also a good buy at $13.00, although I would have liked a bit more acidity and a little less alcohol. Anything more exalted wine-wise, however, would probably have been lost in the heat and spice of the dish; the “Old School” was, then, a pretty good choice. * Home-made hoisin: Combine in a metal bowl 4 Tbs of coconut aminos; 2 Tbs of sunflower seed butter; 1 Tbs of raw honey; 1 minced clove of garlic; 1 Tbs of apple cider vinegar; 1/2 Tbs of sesame oil; a pinch of chinese chili (or cayenne) powder. Whisk together the ingredients. This entry was posted in At Our Farmhouse, Beer + Cider, Hudson Valley Farms, Local Food, Wine, Wine + Food and tagged Brewery Ommegang, Chateau Maris, Chinese Chili, Chinese New Year, Florence Fabricant, home-made hoisin sauce, Old School Rouge 2011, Sawkill Farm. Bookmark the permalink.